This look alike of Taj-Mahal is situated in Aurangabad, Maharashtra. It is known as 'Bibi Ka Maqbara'. Due to its close resemblance to Taj Mahal, it is known as "Dakkhani Taj" or the Taj Mahal of Deccan. It was also built by a Mughal Emperor. It was commissioned by Aurangazeb's son Azam Shah in the memory of his mother. It was built during 1600 - 1601. Unlike Taj-Mahal, Bibi Ka Maqbara is not built using the expensive white marble. However it is a lovely place to visit for those who keen on architecture. Bibi Ka Maqbara is much less crowded than Taj Mahal, and look much pristine. Ajanta caves are one of the oldest archaeological sites in India. Interestingly, it wasn't re-discovered until early 19th Century. Ajanta caves were buried under the dense forest, until 1819 when a troop of British officers-out for hunting- stumbled upon this marvelous construction. It was Captain John Smith of the Madras regiment of the British army who noticed the caves first. It was from this point, up in the mountain that John Smith first noticed these caves which were tucked inside a horse shoe shaped cliff of a volcanic mountain. John smith did an expedition to the caves. On the 13th pillar inside the cave 10, he scratched his name across an ancient painting of Buddha. One can still read it - "John Smith, 28th Cavalry, 28th April, 1819”. When John Smith and troop initially discovered Ajanta, all the caves were covered in 3-4 feet debris. So, This graffiti is located well above the eye level - around 7feet high. Ellora is famous for the Kailashnath temple. At around 2 kilometers from Kailashnath temple, there is a group of Jain caves. The famous Jain cave 32 of Ellora is also called the Royal court of Indra by historians. This cave is famous for colossal yet delicate sculptures. Out of of them there are 2 masterpieces. One is the Matanga Yaksha(left) - the God of prosperity- sitting on an elephant under the Banyan tree. The second one is the Siddhaika Yakshini - the Goddess of fertility - sitting under a mango tree. The time period of these sculptures are around 850 AD. Even though the sculptures are much more than life size, the attention to detail is enormous. One can even observe the monkeys and parrots are carved on the mango tree and they are depicted as eating mangoes. 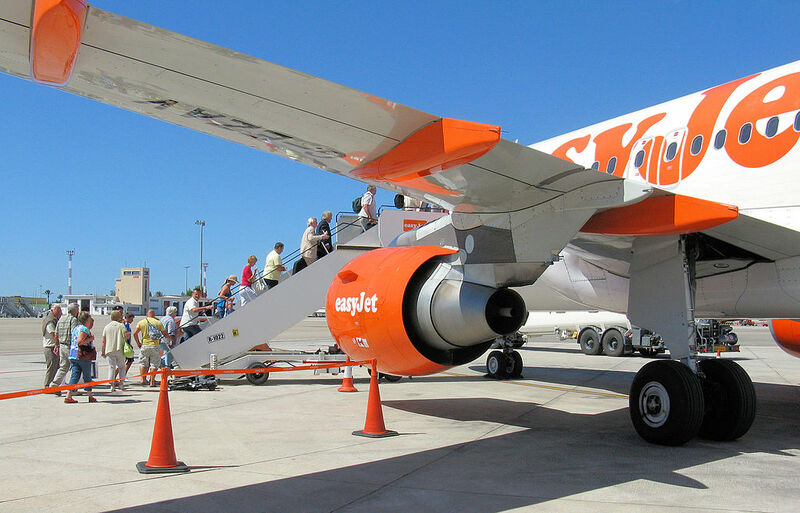 Are you travelling in an airplane for first time in India? It is perfectly fine to get excited and a little nervous. When I traveled for the first time in a plane, I also felt the same. Here are some points to remember for those who travel first time in a domestic airline, specifically in India. Badami cave temples in Karnataka was built by the Kings of Chalukyan dynasty circa 578 CE. Badami cave temples are excavated into a huge red colored sand stone mountain. There are three cave temples dedicated to various Hindu Gods. The 4th and last cave temple of Badami is dedicated to Jain Thirthankaras. 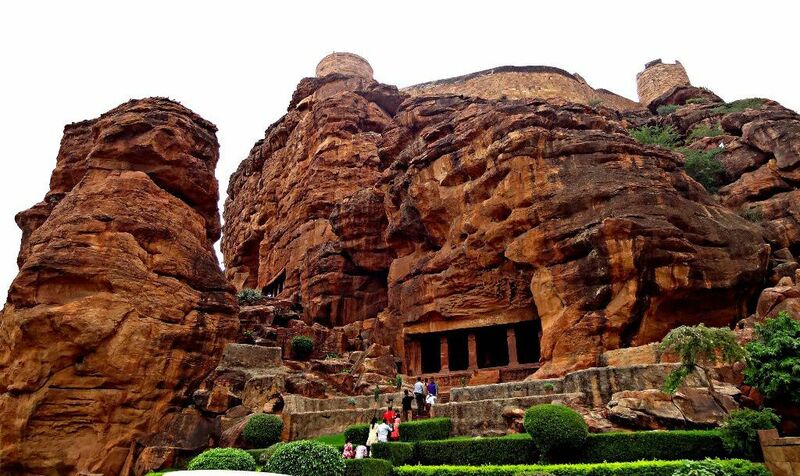 These cave temples of Badami are the house of many delicate and beautiful sculptures. There are sculptures of Hindu Gods like Shiva as the dancing Nataraja, Varaha rescuing Goddess Earth, Vishnu seated on the serpent Sesha. They are the epitome of artistic achievement of ancient India. Badami cave temples are a must visit for anyone who is interested in ancient sculptures of India. 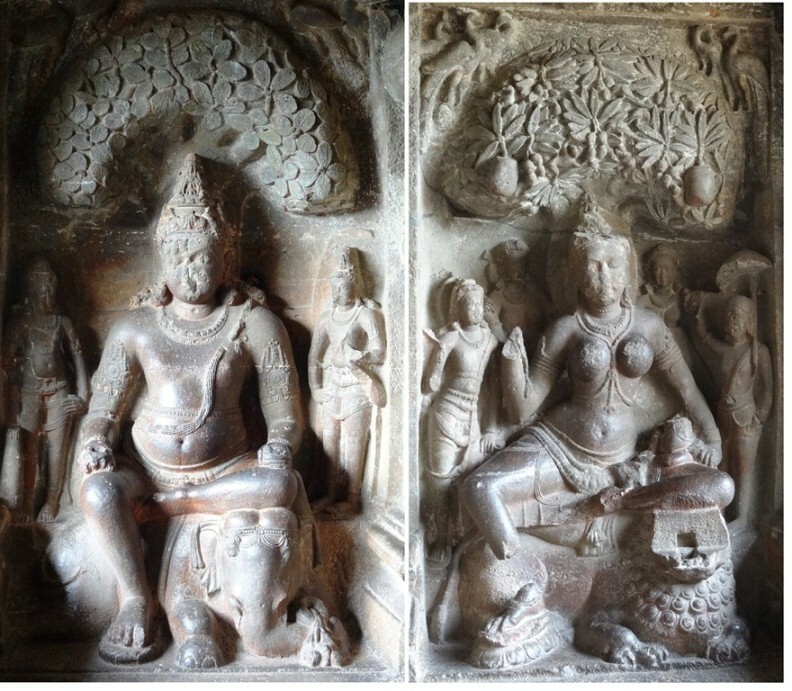 You can read about the Badami cave temple sculptures here in detail. We visited Ajanta caves 7 to 10 in the last article in the series - A guide for Ajanta caves. You can also explore the other caves in this article series here. Part -1, Part-2 and Part -3. In these previous episodes we discussed about the history, art and architecture of Ajanta caves one to ten. In this article we will visit caves 11 to 15 which are not very elaborate or decorated as the caves we saw earlier. In Ajanta, there are two types of caves. "Chaitya-gruhas" or the prayer halls and "Viharas" or living quarters for monks. The prayer halls houses a central shrine with a Buddha image in the newer caves. In the caves from the first(Hinayana) phase of construction, the prayer hall contains a Stupa. The viharas on the other hand contains small cells designed for the monks to live in. Each cell in the Vihara are very small. They have just enough space to accommodate a stone bed and sometimes a pole for hanging cloths. In the first phase of construction in Ajanta, there was a clear distinction between the prayer hall and monk quarters. The 1st century cave 9 was a prayer halls and cave 12 was a monk quarters. However, in the second phase of construction in Ajanta during the Vakataka period (AD 460-480) this distinction was becoming very thin. Cave 11 in Ajanta was constructed in AD 469 - the earlier Vakataka period. 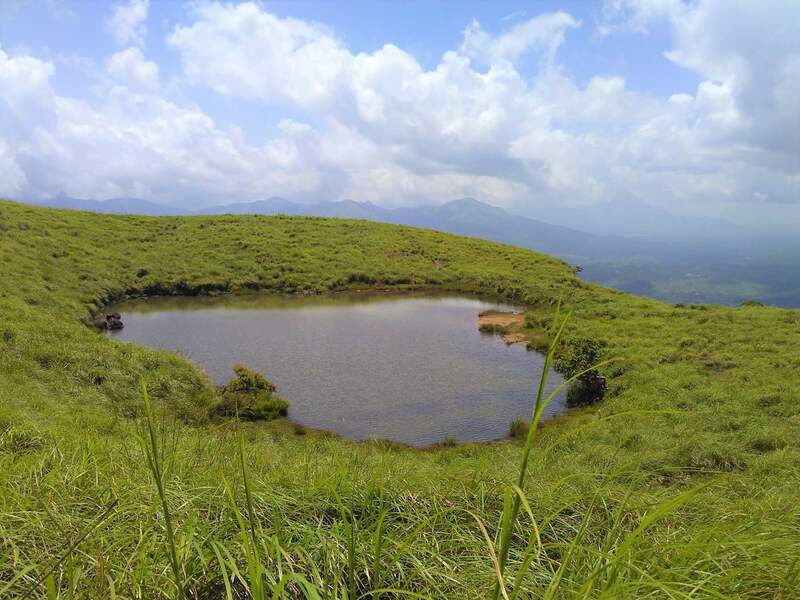 It was initially designed as a Vihara or residence for the monks. However in the later years, it had become a norm to include the Stupas or Buddha images inside the monk quarters as well. Your guide for Ajanta caves will tell you an interesting history of Cave 11 in terms of evolution in the Ajanta construction styles and conventions. Ajanta cave 11 was started out as a monk quarters, later the patrons decided to incorporate a Stupa in the shrine. This is the 4th part of the guide for Ajanta caves. In the last post I explained the history, architecture and art of Ajanta caves 3 to 6. In this part, we will have a closer look at the caves 7 to 10. 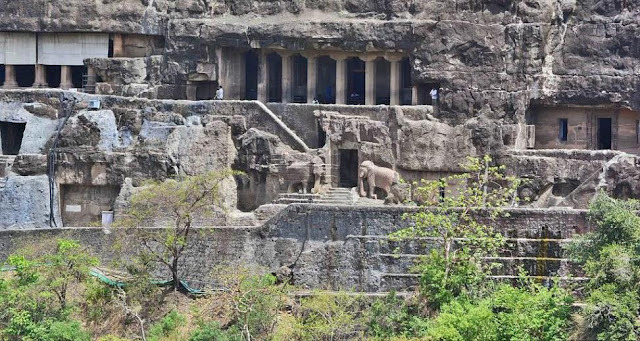 Caves 7 and 8 belong to the 2nd phase of construction at Ajanta that took place during the 5th century AD. This was during the rule of Vakataka dynasty. Caves and 9 and 10 belong to the earlier phase of development at Ajanta during 1st century AD. This part of the guide for Ajanta caves also shares a very interesting details related to the discovery of Ajanta caves.